Hey there! Thanks for dropping by Jessie Mooy's Homepage! Take a look around and grab the RSS feed to stay updated. See you around! Three kilometres from Riberac on the road to Perigueux in a Medieval Archers’ Tower is Atelier la Tour des Bidoux. Unique and unexpected sculptures, ceramics and paintings. Latest work. Birds and Flowers. All Bird sculptures in Limoges Porcelain, Fired to high temperatures. Tournesol sculpture (vendue) enporcelaine peinture tournesol. 2 Unique Stoneware sculptures fired to 1260 degrees Celsius. Can be used outside in frost and snow as well. Sold Petite tête aux Papillons . Jessie was born is Amsterdam, the Netherlands, but lived most of her life in South Africa and since 2009 she lives in France. She has been a professional ceramicist and artist for more than 35 years. She studied Fine Arts at the Art Academy of the University of Pretoria, South Africa majoring in Painting and History of Art. While concentrating on painting in the eighties, she also started working in clay in 1991. Then she started studying sculpture techniques at the Nelson Mandela Metropolitan University in Port Elisabeth in the Eastern Cape where she lived. 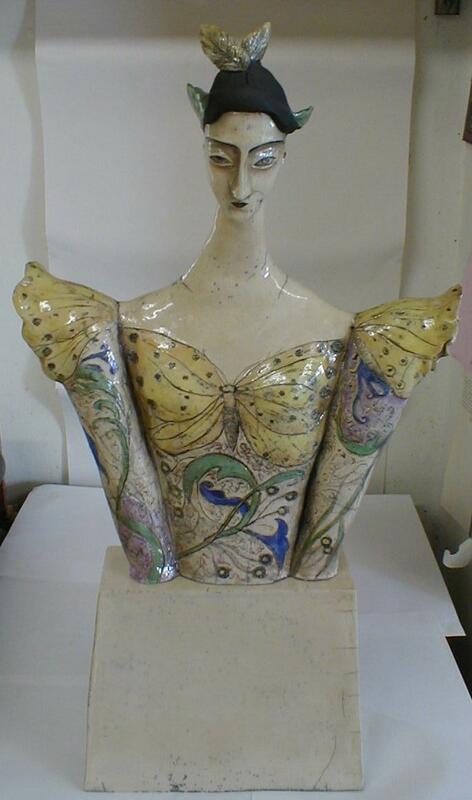 Since 1994 she also worked during summers in Belgium where she had a studio and kiln. Because of political unrest, she moved back to Europe in 2009. Since 2009, she works and teaches hand building of sculptures and ceramics in the Dordogne. There she established her studio, Atelier La Tour des Bidoux in an old Archer’s tower. 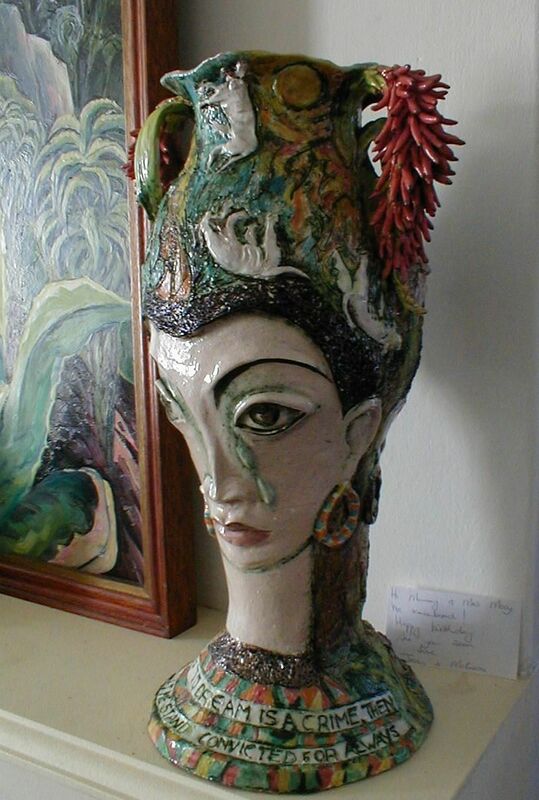 She has won several prizes in South Africa for her ceramic work. If you want to read more about the above information you can scroll down to the bottom of this page. The female in my art and nature as a whole are one concept The image of woman is often used as a counter-force against alienation from nature and from the spiritual. Women are depicted as a life-giving earth mothers or as custodians of all life in nature. In my ceramic work my continued interest in the creative aspect of the earth, plants and all its creatures has been evident for decades, not only in the medium of clay, but also in the formal variety e.g. vessels become flowers or female torsos , handles and rims of vases become leaves and flowers etc. In my more recent work, done in France, I have made a series of sculptural vessels of female torsos painted with the creatures of the sea, the earth and the sky. (see the pictures at the top of the page the works from 2015-2016). The Dordogne is seen as the birthplace of Humanity. Two very interesting prehistoric female fertility figures were found here, namely the Venus Impudique and the Venus of Sireuil. These mystical little sculptures intrigue me and also omfluenced the torsos. The study and observation of nature: plants, flowers, insects and all sorts of animals, especially cats and birds. In 2018 she starts a series of bird sculptures of birds in France in porcelain Royal. 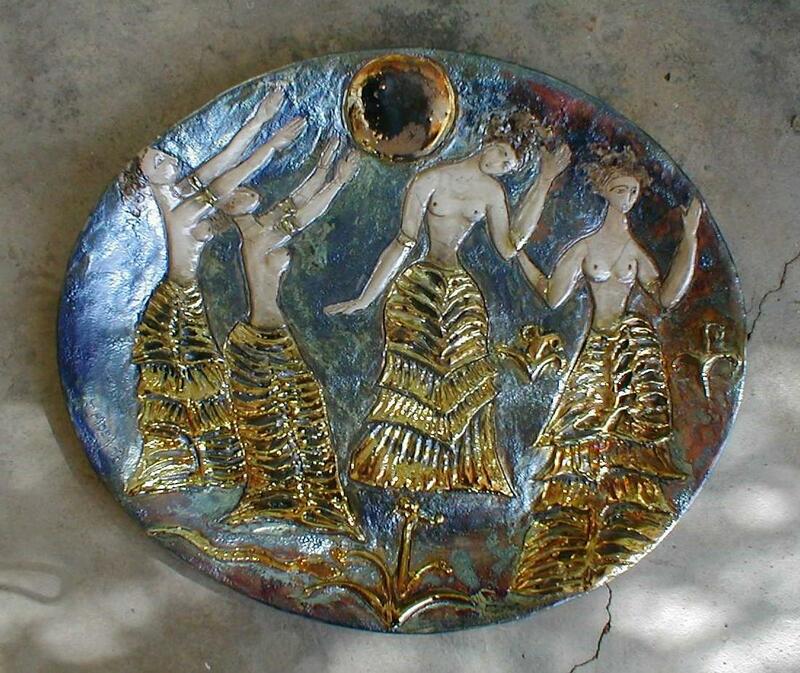 My interest in the female form, also as part of a vessel or sculpture to express oneness with nature. The fertility figures of prehistory here in the Dordogne, reflect all these above-mentioned interests. Through the observation of the creatures and plant forms around us and caring for them and our gardens, a deep connection is established between us and the natural world and I try to give life to this concept. We are all as one in this univers. Cornelia le Roux, Die Burger, Eastern Cape, 29 November 2008 (on Jessie’s last one person show at 19 Hillbrow Place in Port Elizabeth, South Africa” “On entering this exhibition, one is immediately confronted with the big ceramic sculpture African Earth Mother (terracotta) like a slim claystick at a dark pool, a big teardrop falling from her smooth clay cheek. These become tears of blood on her decorated cape. At the back of this sculpture there is graffiti from Homer: basically saying we are earth and earth is us. Pieter van Zyl, Die Burger, East Cape, 21 November 2002:“Jessie Mooy’s Ceramic female sculptures have an air of exquisite fragility. The Nelson Mandela Metropolitan Museum has just bought another of her works: Metamorphosis I for its permanent collection. Mooy has been working since the previous millennium with the feminine aspect of God. In Chalice for a New Millennium she uses Egyptian Mythology to show the power of women. In this image according to an Egyptian Deity, she has the power of night and day pouring the stars out of her mouth and then catches them with her womb. 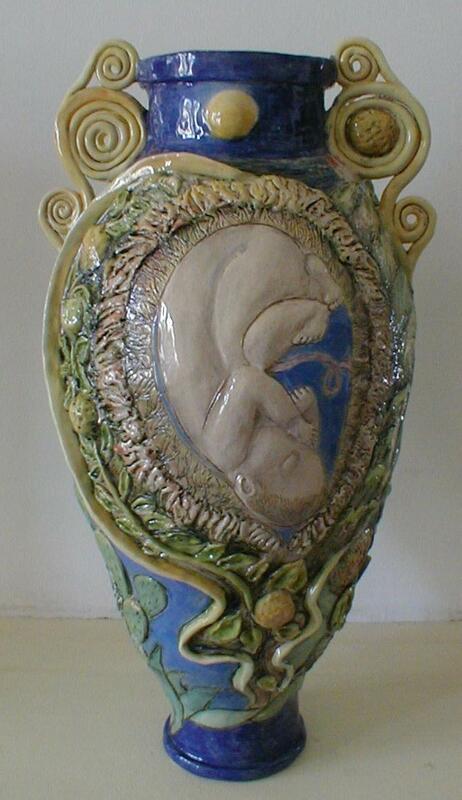 This theme finds its way also in other ceramic works like: Un Mundo where the fragility of life is represented as a foetus inside a womb. Also in her paintings women are represented as custodians of nature and life in general.” Kin Bentley, Eastern Province Herald June 4 1998 Mooy exhibits at Cuyler St Gallery The exhibition, at the Cuyler Street Gallery until June 13, consists of Port Elizabeth land- and cityscapes done in oils, pastels and monotypes, as well as oils exploring the history of the Great Zimbabwe ruins. Dutch-born Mooy has had eight one-person shows in South Africa and has participated in 48 (now 55) group exhibitions, including the Cape Town Triennial. Since 1997 she has set up a ceramic studio in Belgium where she makes raku sculptures for various galleries in Belgium, Holland and Germany. She has worked on four public commissions since 1984, including five canvas panels for the J L B Smith Institute of Ichthyology in Grahamstown, 24 quilt designs for St Bernadette’s Catholic Church, Walmer, and huge monotypes for Telkom’s head office in Port Elizabeth. Kin Bentley, Eastern Province Herald June 5 1998 Artist inspired and assured EXHIBITION of paintings, graphics and ceramics by Jessie Mooy (Cuyler Street Gallery): FEW cities in South Africa have as intimate and visually exciting a built environment as Port Elizabeth. And Jessie Mooy explores its opportunities with an eye hungry to record unusual and unexpected vistas, helped along by an imagination which is able to transform what to us is an everyday scene into a timeless work of art. The lower Baakens Valley is a key area for her, and in South End she exaggerates the height and gradient of its slopes to dramatic effect. The last remaining South End church forms a focal point. 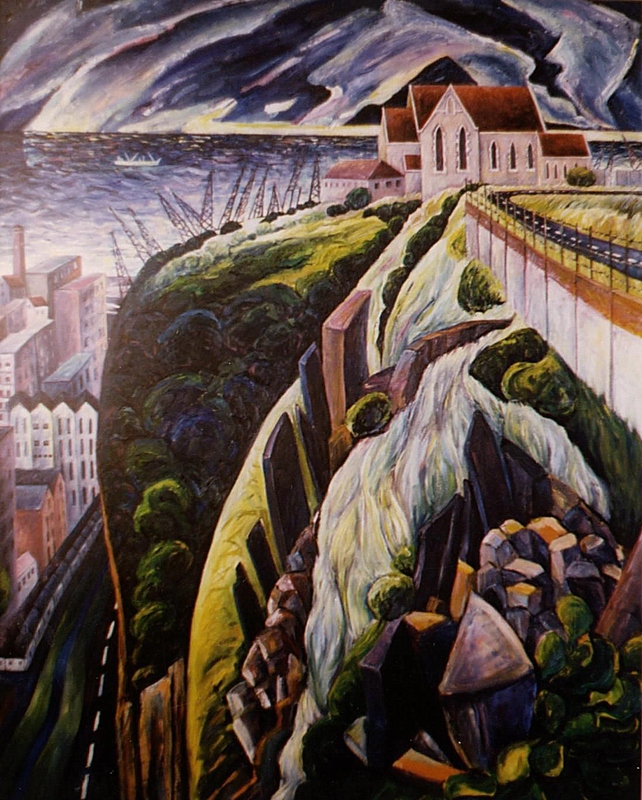 It stands atop a precipice below which stand row upon eerie row of high-rise buildings – more a symbol for the CBD than an exact representation.Similar effects of perspective are achieved in another large oil, The Walk, which shows a girl and her dog walking along a path on the northern slope of the valley, across from that lonely church (obviously painted before South End became Legoland). Another fine work, Settlers Park, captures the abundant vegetation of this green lung, seen – it would seem – from about the point where a high-rise apartment block has been erected in one of the city’s most cynical and obtrusive developments yet. Another splendid study of the city is The Quarry, a view of this landmark seen over that row of old terraced houses in Valley Road. The arrows created by the roofs of these buildings lead the eye upwards to the quarry, and thence to the assortment of buildings above. A small pastel, View of Central from South End, is another amazingly good work, in more traditional mould. A large cactus occupies the foreground and behind it rises the skyline of the old CBD, with the Campanile and old Post Office tower prominent. This is a great piece of drawing – one of several in this medium on the exhibition. Another splendid oil painting, this time a conventional landscape, is Kariega River, which shows a forest of euphorbias around a body of water, with the river meandering in the background. 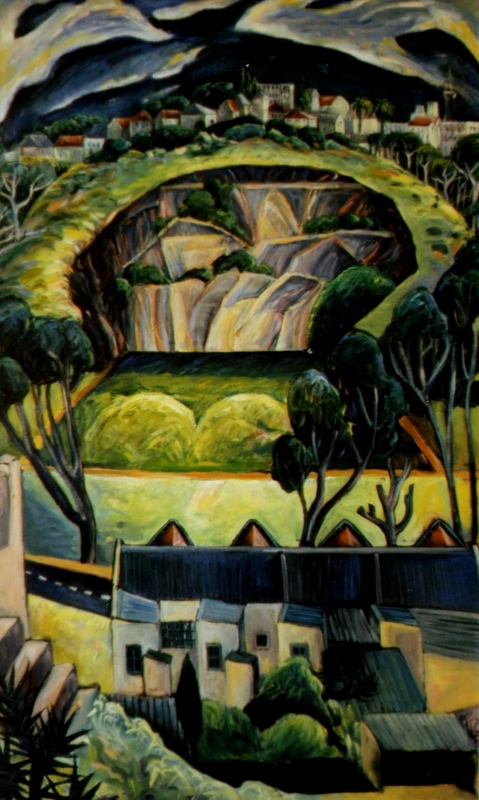 The Grahamstown Group for decades have used the euphorbia in dark, brooding compositions. How nice to see them painted here in light, bright colours which explore to the full their princely forms and interesting textures. Her brushwork, whether painting broad areas like hills or fine details, is assured and inspired. This exhibition contains a wealth more of great merit. our intuitive spirit bodies. … Jessie Mooy’s ceramics are sensuous and sacramental, filled with voluptuous natural forms, gilded and silvered and pulsating with ripe generative life. Professor David Edwards, “The Return of the Repressed Feminine” published Dec. 1993 in The Phoenix, Vol. 6, No. 3, by the Albany Museum, Grahamstown, South Africa (A talk given at the opening of the art exhibition “The search for the feminine aspect of God” in the Standard Bank Gallery of the 1820 Settlers Museum, Grahamstown, on 6 August 1993)For James Hillman, the Archetypal Psychologist, images are the irreducible matrix of the human psyche. It is images which motivate our behaviour and programme the quality of our emotional and motivational life from moment to moment. What depth psychology has shown us is that these guiding images may often be deeply unconscious and that much of the alienation that people feel is due to an alienation from this source of creativity and authenticity. In most traditional cultures the shaman is a person who learns how to venture into the unconscious to meet and engage with this imagery source (for example in the form of mythic stories or in the form of encounters with spirit guides and deities), and in so doing to bring back to the people of the culture perspectives on the powerful unconscious forces which are at the root of cultural life. The successful shaman therefore must shuttle between two worlds. In this sense an artist can be a shaman and I have no doubt that the artists whose material is discussed here are shamanistic in this sense that they have realised in their painting and ceramics powerful guiding images which are the root of important cultural processes that are underway at present. All art has a personal dimension for the artist who is inevitably working out his or her personal struggles and dilemmas. But the personal dilemmas are always embedded in universal dilemmas; struggles which many people within a culture are engaging in and working out day by day. The first reaction of many people to this exhibition was a refreshing feeling of meeting something familiar yet somehow lost, of meeting something that speaks to them in a way that much contemporary art fails to do. I believe that the reason for this is because it has that sort of archetypal significance. It is spontaneous transpersonal art, which recovers a vision of womanhood which is generous, fertile, sensual and has a self-authenticating self-respect, constructive potency and spiritual dignity. This exhibition is described as a search but it is more than a search, it is a finding and a recovery. … It is this kind of systematic brutality against an ancient spirituality that led to respect for the divine feminine becoming deeply repressed in the collective unconscious of our culture. Within Catholic Christianity some of the old traditions survived in the Veneration of Saints and the Virgin Mary. The Protestant revolution destroyed much of what remained of the ancient earth religions. Why am I telling this long story? Because unless we understand it we will not understand the significance of this exhibition. Jessie’s Black Madonna recalls an ancient European tradition of the Black Goddess. She is black not because she is African, nor because she is of the underworld or because she is evil, but because she is of the soil, because she is of the fertile earth, because she remembers that the bodily fertility of woman, in menstruation and child-bearing and milk-giving, is somehow energetically connected with the fertility of the earth. Ralph Metzner who has documented the history of the split between spirit and nature in European consciousness, and from whom I draw much of what I have said here, tells us that there are still six black Madonnas extant in European churches today. I find it moving that Jessie has made a black Madonna for South Africa. Jessie is a remarkable woman. She is a committed Roman Catholic and comfortable within that tradition yet she is a spontaneous nature mystic within whose being these ancient images of divine woman come flooding in. Jessie describes her Forest Nymph as a Madonna too. Her contemplative eyes speak of a direct access to the sacred; her generous breasts speak of an unselfconscious fertility. Jessie’s comfort with this juxtaposition of the Christian Madonna and the forest nymph remind us of the deep roots in an ancient spirituality of the Christmas story and the devotional appreciation of the mother and baby image. Each of Jessie’s ceramics has its own story. Nonquese’s Dream is based on the story of a Xhosa girl in the last century who had a visionary experience of all of the people working in harmony with each other and with the land. On the one side of the vase she is pictured with her eyes glazed in a trance-like state experiencing the vision of humanity flourishing in a gentle land with rich harvests living in harmony with each other and the natural world. But the dream is not realised, the people fight. They fail to respect nature or to live in harmony with it. There is famine and destruction. Many people perish. On the other side of the vase we see Nonquese looking at this destruction and weeping out the pain and disappointment. … I believe that these works are drawn from a hidden wealth at the mysterious heart of the planet’s historical unfolding. These artists have let that source speak to and through them. Through being here reflectively with these works perhaps we can let that source speak to us too and guide us to find our own place in the challenges that face all of us as potential planetary citizens in the last decade of the twentieth century. 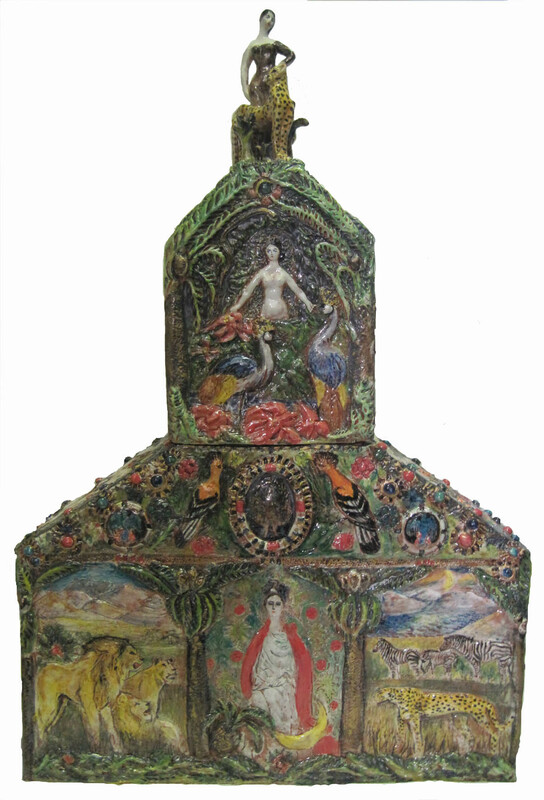 Robert Brooks, National Ceramics Quarterly No.21, 31 August 1992 Eastern Province Institute of Architects Merit Award for Ceramic Art 1992Jessie Mooy made a beautifully integrated work called Queen of Sheba’s Reliquary (purchased by the Durban Art Museum in 1995). It was a true reliquary in that you could open it and find mysterious objects inside. Again a wonderful way to depart from the brief. The box is covered with images with green the base colour so there is lots to read and look at. The technique was quite strange in that glazes were “runny” but did not overrun their boundaries – it reminded me of a classic line from ‘MacArthur’s Park” by Peter Webb as sung by Richard Harris “all that pale-green icing running down”. This work drips beauty and good intentions and was as honest as the day was night. Jessie’s work has been taken up in national and international collections and has been acquired by various Art Museums in South Africa to form part of their permanent collections as mentioned below. She also received numerous awards and prizes for her ceramic work in South Africa. South-Arica, United Kingdom, Netherlands, Belgium, Australia, Spain, Portugal, Germany, France, United states of America, China. from 1997 to 1998 J Van Den Elshout Gallery, Den Haag, Holland. 1996 “Fish and People” exhibition, Department of ‘Ichthyology, Rhodes University, Grahamstown Arts Festival, Eastern Cape. 1993 The Feminine Aspect of God, St. Patrick’s Church Hall, Arts Festival in Grahamstown, Eastern Cape . Images are copyright of the artist, their respective owners, assignee’s or others. Hi Jess, this lovely page sgould link up to Facebook so I can like it. Great to see your work again. Beautiful work, ancient emotion, delicate. Beautiful work. I am a clay sculptor too and work with similar themes. i love your delicate expressions and colors. Hi Phyllis, Thank you, I also like your delicate colours!!!!!!! Very nice site! Many of the work looks familiar! Some of them I haven’t seen. Beautiful! Thank you Pauline. I do love your stick birds! Thank you Polly Saul. I hope to see you some time in the Dordogne! Bought a vase in 92/93 at a gallery near Knysna, travelled to Jhb with it between my feet. Love it. Mijn twee vasen -my most loved possession! Merci Dielle for your kind words. I always try to inspire the artists that work here. Every person is different and their own vision must show in their work. As a teacher it always amazes me what comes out of their hands when they have a true affinity for sculpting with clay.